The sun is shining today, and it’s actually warming up. I’m looking forward to spring! Of course, we’ve still got a ways to go. It’s been cold, and we seem to alternate between rain showers and snow flurries. When it rains for long periods of time, most of the critters take shelter. 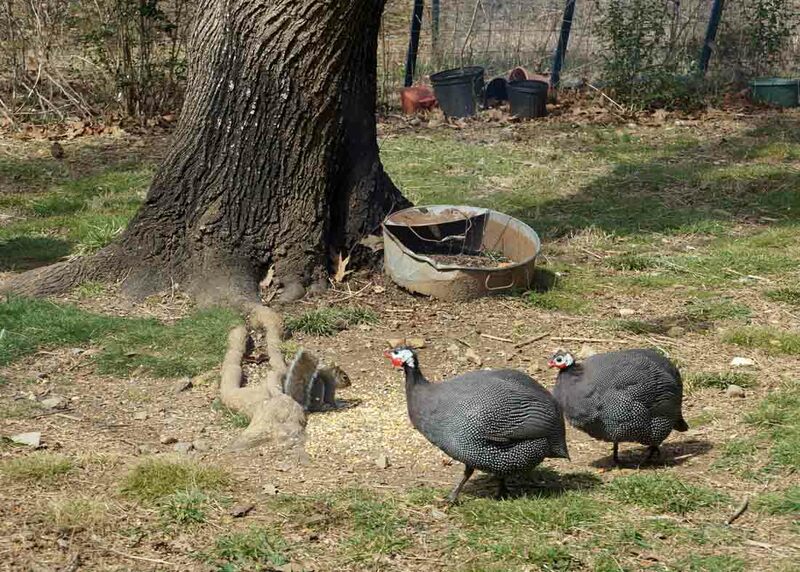 However, the guinea fowls don’t always do that, and then they look kind of pitiful out there. Mind you, there are plenty of places they could get in out of the rain! 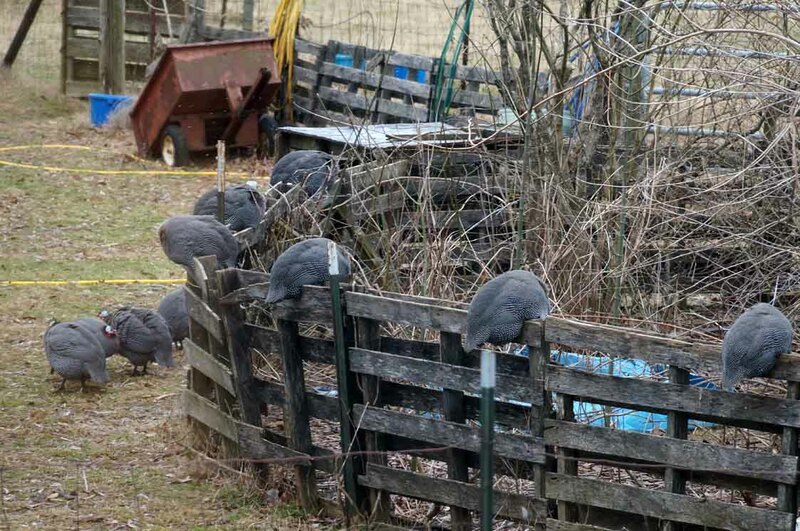 There is an open poultry pen behind our feed room. There is plenty of perching space inside the sheep shed as well. But no, they sit on a fence outside in the rain. Go figure. I suppose even if I had all the cool chicken coops in the world, with doors hanging wide open, those crazy guinea birds would still sit in the rain. Perhaps it is a measure of their intelligence that they “haven’t got sense to come in out of the rain”??? I don’t see the squirrels out in the rain so much, but on sunny days, they are bouncing around everywhere! 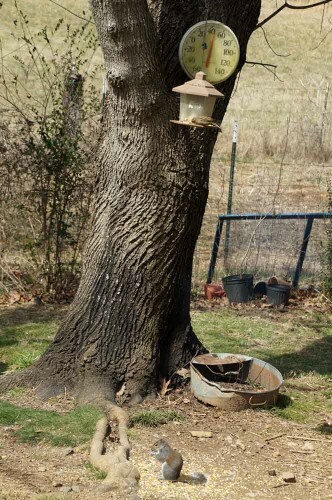 They have highways in the trees, across the roof of our house, and sometimes when they are very, very stupid, the squirrels also hop onto the transformer on the electrical pole nearest the house. On sunny days, one of their favorite things to do is eat the corn I throw out for other creatures. I see them inside the peafowl aviary, helping themselves. And I see them here also. . .
What this little red squirrel may not realize is that he is essentially getting manna from heaven. 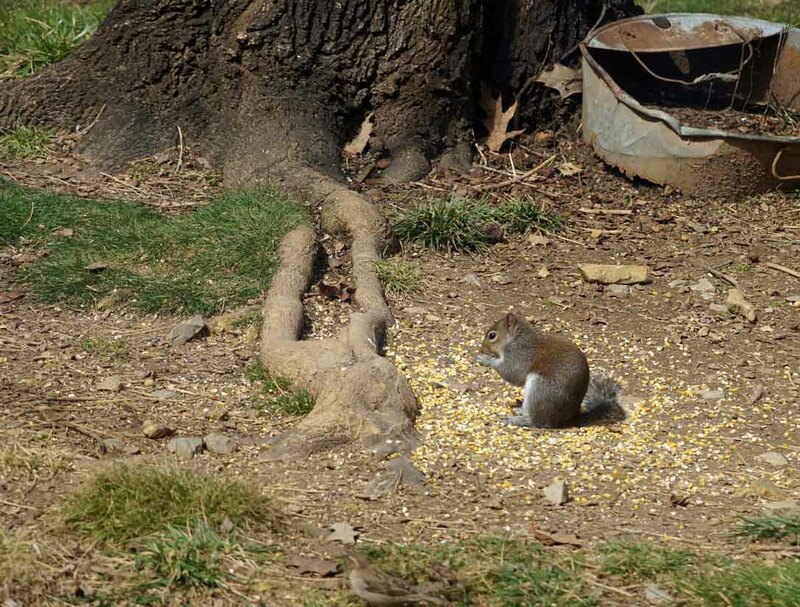 All that corn on the ground comes from the birdfeeder above them. . .
Those dratted English Sparrows throw out as much corn as they eat, so the squirrel gets to benefit from their sloppy eating habits. But the squirrels aren’t the only ones to enjoy this corn from above. 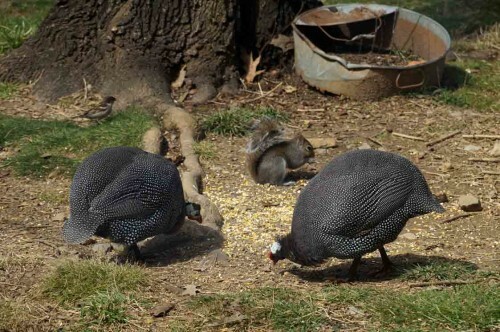 The guinea fowls have come upon the scene, and are deciding if they want to share a table with such riff-raff as a tree rat! As they usually do, they decided to ignore the peasant squirrel, and went about eating their share of from the cornucopia of goodies. They all happily munch up the corn while studiously ignoring each others presence. I guess it’s a pretty workable relationship. The sparrows enjoy the corn while throwing it about with wild abandon, the squirrel eats a share, and the guineafowl also eat their share. At other times, the chickens get in on the act, and have a go at eating up some of that corn as well. Probably the only individual not getting a great deal out of this is The Farmer, who has to buy the 50-pound sacks of corn that seem to disappear with alarming rapidity around here. As far as he’s corn-cerned, it’s just another bill. But I’m sure all the critters appreciate his generosity.